Some may think the combination of cantaloupe and proscuitto may be an odd combination, but they really compliment well. The subtle sweetness of the cantaloupe pairs nicely with the saltiness of the proscuitto, making them really balance out. Together, they can stand up to the peppery bite of arugula. Finishing the salad is the sweet tang of balsamic vinegar. I used a fig balsamic vinegar but any regular balsamic vinegar will do. This makes for a nice change of pace as a salad course and it's colorful in time for spring and summer too! In a small non stick skillet over medium high heat, place minced prosciutto and pan fry until crispy. Remove from pan and set aside. Place 1 cup of baby arugula on a salad plate. 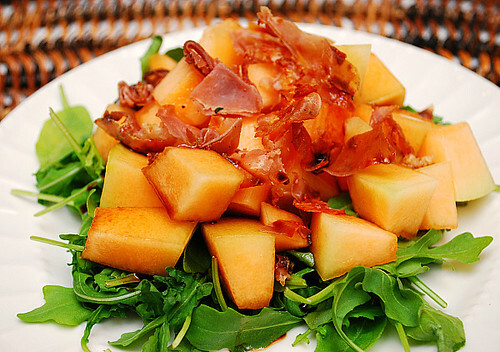 Top with 1/2 cup diced cantaloupe and top with half of the crispy prosciutto. Drizzle a little balsamic vinegar over the salad and serve. Repeat with remaining ingredients for another salad.